NEW YORK, NY--(Marketwire - April 28, 2008) - Camp Broadway®, Broadway's Original Summer Camp, salutes legendary composer Charles Strouse this summer at its two music-filled 5-day sessions in celebration of his 80th birthday (June 7) by featuring excerpts from his enduring musical comedy "Annie" and the timeless musical, "Bye, Bye Birdie." Camp Broadway's summer sessions are being held in New York City on July 14 - 18 and August 4 - 8. Applications are now being accepted for Shining Stars (for 6-8), Camp Broadway Classic (for 9-11), CB2 (for 12-14) and Next Step (for 15-17) at www.campbroadway.com. "Both 'Birdie' and 'Annie' enjoyed success on Broadway and around the world, but what excites me most about each is that both shows have introduced so many young people to the musical theatre... on both sides of the footlights," says Charles Strouse. "I am thrilled that Camp Broadway has decided to workshop these two shows with students. I look forward to working with some of these young and talented people." "Camp Broadway is Broadway for kids," says Camp Broadway Artistic Director Tony Parise. "These two shows are Broadway classics whose popularity spans nearly three generations. Charles Strouse is a theatrical treasure. We are proud to celebrate his work and enable our young singers and dancers the opportunity to be immersed in the time period, the musical style and the theatre traditions that surround these shows. Through the unique experience of learning from trained Broadway professionals, kids develop a keen appreciation of the art behind the artform. We believe this understanding helps develop the next generation of theatergoers." 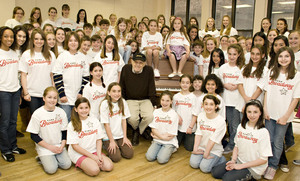 Camp Broadway is taught by experienced Broadway teaching artists. The program includes instruction in singing, dancing, movement and scene study; meet-and-greets with creative talents, special events and additional benefits tailored to each age group. In addition to learning these shows, young theatregoers will also attend Broadway's new hit production, "In The Heights." Details on each program and the enrollment application are available at www.CampBroadway.com or by calling 212.575.2929. Space is limited. About Camp Broadway®: Founded in 1996 as a 5-day summer camp, the company has grown into a year round leader in theatre arts programming, educational publishing and special events. Recipient of the 2002 Standing Ovation Award from the Educational Theatre Association, Camp Broadway is dedicated to presenting programs that promote life-long learning through the performing arts.